Natalia Outeda, Frassaï’s founder, was born in Buenos Aires and has a background in fragrance development, floral design, and jewelry design. Fittingly, Frassaï sells jewelry with an organic inspiration, scented candles, and, now, three Eaux de Parfum — Verano Porteño, Tian Di and Blondine. Perfumer Rodigo Flores-Roux developed Verano Portẽno, and its notes include Calabrian bergamot, cardamom, jasmine, Argentine maté, wallflower and vetiver. Frassaï describes it as creating “a bright burst of sophisticated freshness capture the feeling of Buenos Aires during summertime.” What I expect: a green, fresh, splashable scent with a hint of spice. What I get: the sensation of walking in the wake of a gas-powered lawnmower. Perfumer Olivier Gillotin developed Tian Di, and its notes include ginger, peach elixir, red chrysanthemum, Chinese incense, orris, sandalwood and olibanum. Frassaï describes it as a fragrance to “open the mind, purify the body and awaken the spirit.” What I expect: a woody incense. What I get: a sandalwood bonbon after a ride with hairpin curves. Tian Di’s incense surfaces right away, but it’s incense that smells initially to me like it’s tinged with peachy spearmint and crumbled shortbread. A musty but interesting veil settles over the combo, sort of like the smell of a cold, used teabag, and the incense morphs into peachy sandalwood. Over the next hour, Tian Di sweetens and simplifies into something Pierre Hermé might create if challenged to use sandalwood. Tian Di is fun to sample just to see where the heck it will end up. Yann Vasnier developed Blondine, and its notes include salted butter caramel, pear leaves, ashok flower, tiger lily, cocoa and blond musks. Frassaï says it was “inspired by the 1920’s French fairy tale.” What I expect: dessert in a spritzer. What I get: a tender green floral and my favorite of the trio. Yes, Blondine does carry a hint of sweet saltiness at the outset and a texture of chiffon-thin woolly musk, like a cashmere veil. But the rest of the fragrance is leafy non-diva, nondistinct flowers in a cool breeze. No dirt, no roots, no chocolate ganache. Yet for all Blondine’s delicate texture, there’s some man-made chewiness to the fragrance. It’s a strange and — to me, at least — alluring and wearable combination of nature and laboratory. 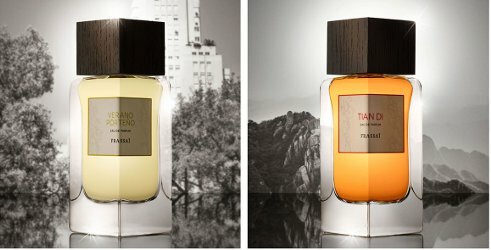 Frassaï Verano Porteño, Tian Di and Blondine Eaux de Parfum are $35 each for a 10 ml rollerball or $130 for a 50 ml spray. A rollerball trio in a suede pouch is $80. 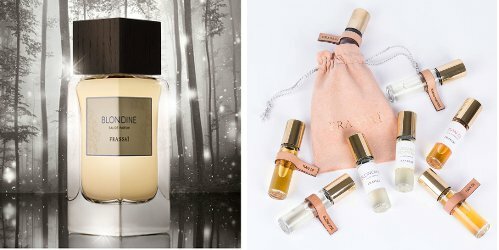 The fragrances are available on Frassaï’s website. I am sitting here laughing out loud. I probably shouldn’t have reviewed that one since it had the (for me) deadly dry down, and I know others will adore this fragrance (and i hope they comment!) but that’s kind of how it hit me. Oh no my dear, don’t change a thing! First time I’ve ever seen or heard the term ‘wallflower’ applied to anything other than a shy person. I had to look it up just now to confirm it’s actually a plant. The things I learn here . . . . I learn a lot here, too! SF/Angie…and if a perfume really did smell like wallflowers I’d buy it in a second. I can picture wallflowers–I know they’re common garden flowers–but I couldn’t tell you what they smell like. A note on the ‘Verano Porteño”…. yes, BsAs is humid…VERY humid and in the summer that humidity suffocates. As a porteño myself I can attest to that. The most overused phrase in Buenos Aires when talking about the weather is “Lo que mata es la humedad!” “It’s the humidity what kills you!” So it seems accurate although i don’t know if i’d want to replicate that! That’s kind of cool, really, that the fragrance might mirror that part of summer! Bravo! Laughing out loud Angela! : Gas powered lawnmower and sandalwood bonbon after hairpin curves. ???? Love It! Having lived in the Philippines I know that aggressive, thick, choaking humidity. I’ve also driven Franklin county / VA’s- Appalachian backroads -and experienced those flinging switchbacks. Brilliant connection to memories! Gave me a good idea of whether or not I’d need to bother :). Do wish everyone’s reviews started with ‘what I got out of it. So much more helpful- at least to me. I’m glad you enjoyed the review! It’s honest–at least to my skin and nose–but I’m sure others will have other perspectives, too.